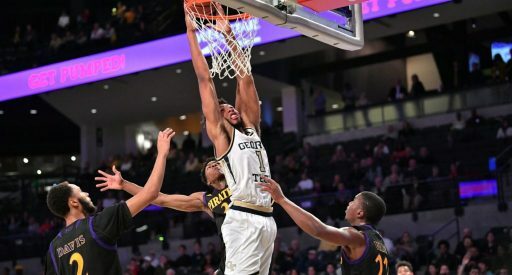 The Georgia Tech Yellow Jackets look to continue to protect their home court Friday, hosting the Prairie View A&M Panthers. The game tips at 4:00pm EST and will be broadcast on ACC Network Extra. Pastner's Yellow Jackets are 3-0 at home this year and 18-4 in out of conference home games during his tenure. Currently, Georgia Tech ranks #71 in the KenPom rankings while Prairie View A&M sits at #277. Prairie View A&M averages 69 points per game on offense and surrenders 74.8 on the the season. Kenpom predicts a final score of 78-62 in favor of the good guys for this one. The Panthers come into the game with a 1-5 record. They are led by fourth year coach Byron Smith. During his tenure the Panthers have a record of 36-49 and have never finished with a winning record. It should be noted that he has only coached two full seasons. They are a member of the Southwest Athletic Conference. A traditional one bid league, the SWAC has been represented in the NCAA tournament by Texas Southern in 4 of the last 5 NCAA tournaments. Smith's crew comes into McCamish with a back court trio of guards that can score the ball. Seniors Gary Blackston and Taishaun Johnson along with junior Gerard Andrus combine to average 37.8 points per game so far this season. Though they are led by their backcourt, the Panthers are not a threat from deep. They currently rank 334th in the nation, shooting 25.5% from three. They are however 50th in nation in three point percentage allowed at 27.7%. The Panthers are led by junior Devonte Patterson in the paint. An undersized post, Patterson averages 12.8 points and 7 rebounds per game. He is not much of a rim protector, collecting just 2 blocks in four games. The Jackets and Panthers have three common opponents so far this season. While Tech is 3-0 against Lamar, UTRGV and East Carolina, Prairie View lost to all three squads. Those games are all part of the Panther's current five game losing streak. The first game of that streak was a loss at Baylor, a game in which Prairie View actually hung around, eventually falling 91-80. To date, the Bears are the only power 5 school that the Panthers have faced. It should be noted that the Panthers did play UNC-Greensboro tough in Greensboro, only falling by 8 points. This is a game that the Yellow Jackets should handle quite easily. It's not a game that I would expect to see Evan Cole, as his presence is most likely unnecessary. My prediction for today is that James Banks has a big day. The transfer big man saw his minutes played jump from 16 to 19 last game and given the energy and rim protection he brings, I think that trend continues. He is currently averaging 16.5 rebounds and 5.5 blocks per 40 minutes played through his first three games. In light of Prairie View A&M's poor shooting, I would expect Pastner's crew to sag a bit and pack the paint, daring the Panthers to shoot. Missed long shots typically lead to long rebounds which could lead to easy baskets in transition for the Jackets. The line for this game has moved from GT(-14.5) to (-16.5) and back down to (-16). Pastner and the Jackets should cover easily at home. Don't care what anyone says about Alston.. he saved several games for us last season and continues to do so. GTHomer, lauraee, ramblinjacket and 5 others like this. Alston has been very solid so far this year. It was mentioned in an article that he had a stomach injury last season that required surgery at the conclusion of the year that limited his ability to play. So far it looks like there may be some truth to that but he still must do it against better competition. Best thing out of this game was seeing Jose get really aggressive in the 2nd half. IMO he has been overly passive early in the season, too willing to defer. i think he needs to be the alpha, He's a deceptively good scorer off the dribble, despite his size, he finished at a higher rate at the rim last season than Josh did. Glad to have a bad outing but get a win instead of a loss. This team has a long ways to go. We could have been Wake, start the game 7-0 against Houston Baptist. Lead by 4 at half, 14 with 9 min to play, 7 with 1 min 9 sec to play, Houston Baptist hits a 3 at the buzzer to send to OT. 4 pt lead with 1:15 left in OT, lose by 2. LibertyTurns, Bruce Wayne, msargent1 and 3 others like this. Every interview I see with Pastner, I walk away impressed. I have full faith in what he's building. A couple committed recruits would help that a bit though. LibertyTurns, GTNavyNuke, okiemon and 2 others like this. Are we not entitled to a poor game? We did what we needed to do win (by 11), after playing our poorest game of the season. Take a deep breath, have a drink, and chill. A W is a W!! MiracleWhips, GTNavyNuke, msargent1 and 2 others like this. Nope we are going to surprise some people. Hopefully have a chance @ nit. msargent1, THWG, AE 87 and 2 others like this. I was there, totally agree with the statement. D was pretty good most of the game, PV made some tough shots and had several shot clock violations. First half (and part of second), offense stood around and relied too much on someone beating their man - cuts were passive, Banks/AD did not distribute well from high post (we have been spoiled with Lammers passing from there). When we got open looks no one made any. The only run in first half was off the defense. Last years team probably loses this one. If we play like this against most ACC teams we lose by 15-20. Good summary...I was one of the 500 there (lol) as well and have to agree with pretty much everything here. We were in such a shooting funk in the first half that we could never find any sort of rhythm, but we strung together a few steals/blocks that allowed us to get a few transition baskets that were sorely needed. PVAM played hard too, you have to give them some credit - no idea how they managed to lose to ECU and Lamar. Outside of Jose, Brandon has been our most solid backcourt contributor. As I said prior to the season, he’s a steadying influence for our young guys with his leadership ability (I even saw him in his Banks ear), and he’s become one of (if not the) best outside shooters on the team. While we lose a good bit on offense with AD and Banks on the court together, that may be our best defensive unit and easily our best rebounding unit. IMO, that’s why we saw them out there at the same time so much today. Our D was powering our offense throughout the game. Glad we could grind out a W while playing our poorest game of the year. Bruce Wayne, New Old Guy and msargent1 like this. This was a good outcome - we lost the game and will hopefully learn a lot from that - but we didn’t have to take an L in the L Column like we did last year against Grambling. Alvarado reminds me of the Austin twins - nobody has a bigger heart. GTNavyNuke, Bogey404 and THWG like this. This team has a defensive identity. It hasn’t found an offensive one. If it finds one on offense, it can be good. Fatmike91, THWG and MikeJackets1967 like this. Gueye has fewer fouls per minute than either Ogbonda or Banks. Bruce Wayne, MikeJackets1967 and orientalnc like this. I think it’s the smart play. We play up on these guys and they get into the lane and get our foul happy bigs in trouble it could be closer than we’d like. Since we are likely to very easily win the game, don't we want to practice on improving our weaknesses? I.e. bigs learning how not to foul? AE 87, Peacone36 and MikeJackets1967 like this.